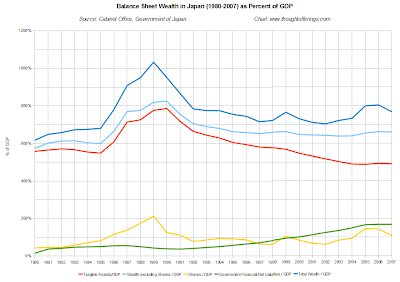 While gradually learning more about Modern Monetary Theory (aka Chartalism) I've started looking at the balance sheet tables in the official national accounts data of the US and Japan. MMT emphasizes stock-flow consistent modeling of the economy when analyzing the impact of various private sector and government actions. Separately, I've started creating a macroeconomic balance sheet visualization tool to illustrate this approach. But in this post I'll share some charts of the real world "stock" data (i.e., accumulated aggregate wealth). I'll likely share some related "flow" data (i.e., components of Gross Domestic Product as a measure of national income) in a subsequent post. One of the principles of MMT is that the non-government sector (which includes the domestic private sector as well as the foreign sector) cannot change its own net financial assets. Only the government can, by running a deficit or a surplus. One of the key roles of a government deficit is to allow the private sector as a whole to net save (i.e., spend less than it earns). 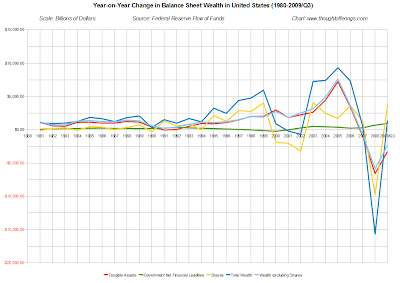 This results in an accumulation within the non-government sector of "wealth" (also referred to as balance sheet equity or net worth) in the form of government liabilities, which are a mix of treasury bonds (and notes and bills), physical currency (notes and coins), and bank deposits (matched by corresponding bank reserves). These are all just liabilities of the government with different durations and interest rates, and they never have to be paid back (though with a healthy growing economy they often shrink as a percentage of GDP). The emphasis that government liabilities are also assets is one of the most important insights of MMT, in my opinion. The primary limitation to running government deficits is inflation. These aggregate "stocks" are illustrated in this simplified balance sheet diagram that excludes tangible assets — the government sector (combined treasury and central bank) has (as an indisputable accounting identity) negative financial net worth (i.e., when you exclude tangible assets like buildings and equipment) exactly equal to the positive financial net worth of the private sector. In this case $160 (just toy numbers for illustration) — the blue boxes labeled "equity" and "negative equity". 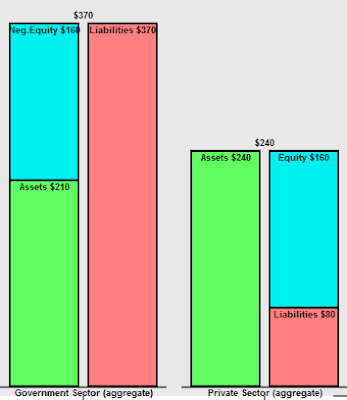 Balance sheet equity or net worth equals assets minus liabilities. Note, this graphic leaves out the foreign sector for simplicity. However, there are a few areas I still find myself disagreeing with MMT on (subject to change as I learn more!) and one is the treatment of equities/shares (in the stock market sense). In short, when the market bids up stock prices, owners of those stocks feel wealthier, but the corporations to which those shares are a liability do not act correspondingly poorer or reduce their propensity to invest or generate revenue in any way. I could elaborate but will leave it at that for now as that is not the focus of this post. Tangible assets (real estate, equipment, software, etc). Net government liabilities (since these are assets to the private sector and typically never have to be paid back on aggregate). There are two totals in each graph, one including stock market valuation and one without, because as mentioned above the appropriate treatment of this seems debatable to me. You the reader can choose which total you prefer. 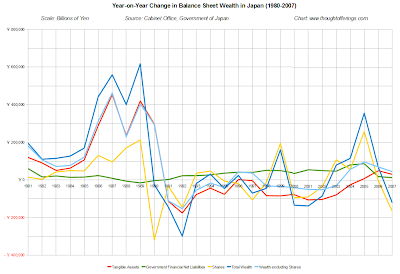 I don't know how directly comparable the Japanese and US data are. It is possible that the underlying accounting (for example what is included in tangible assets, how values are determined, etc) could differ substantially. But in a broad trend sense the comparisons are still interesting. One significant difference I know of is that the tangible assets data for the US only includes households, corporate non-financial business, and non-corporate business, whereas the Japanese tangible assets data includes all sectors (government and financial corporate being two large sectors that are not in the US data). Japan's stock market peaked (on an annual basis) in 1989 (yellow line). Its real estate bubble peaked in 1990 (red line, to which real estate and land are the largest contributors). Aggregate balance sheet valuation of tangible assets declined from 1990 until 2004. While this is probably due primarily to declining market prices (revaluation and/or depreciation), it's possible that quantity also changed. Government deficits have clearly helped stabilize nominal private sector wealth relative to what would have occurred otherwise (see the dark blue and light blue lines for totals with and without stock prices). 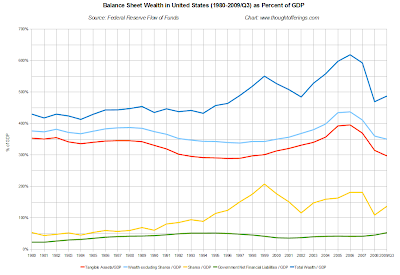 Government liabilities are not particularly large as a percentage of total wealth. Of course the annual deficits that created the net liabilities would have contributed significantly to incomes, and that effect is not shown here. NOTE: US tangible assets shown here does not include all sectors (see note above). The US had two stock market peaks (note that this is the entire public share market as captured in Flow of Funds data, not a particular index such as S&P500), first in 1999 (on an end of year basis), and second in 2007 (see yellow line). Tangible asset prices (red line, dominated by real estate) peaked in 2006 (on an end of year basis). Wealth relative to nominal GDP adjusts in rough terms for changes in price level (inflation), demographics, and productivity. 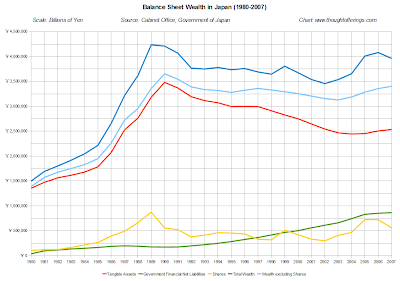 Because Japan's GDP has partially stagnated, wealth relative to GDP does not look dramatically different to wealth in nominal terms (prior graph). Wealth relative to GDP has slowed its fall and is in the rough vicinity of the level from before stock market and housing bubbles accelerated in the mid 1990s. I don't know whether wealth-to-GDP is mean-reverting or even meaningful over long periods of time, but if it is, perhaps this reversion is a positive sign of stabilization suggesting nominal wealth need not fall much further. Though given the likelihood of further falls in residential and commercial real estate prices (the opinion of many credible commentators), a not-so-positive alternative is that both nominal wealth and GDP could fall at the same time, still leaving their ratio semi-stable. Japanese public companies inherently less profitable. Japan's market pricing in lower growth prospects. Japan's publicly traded companies commanding a smaller share of the economy (relative to private enterprise) than US publicly traded companies. US stocks still look overpriced relative to GDP, though a longer time line is needed to confirm this, and a valid justification for the higher level could be if public companies control a larger share of economic activity than in the past. The year on year change makes it easier to see the magnitude of the changes in the previous graphs. 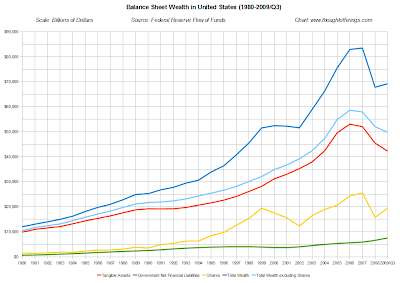 From a wealth perspective alone, increases in US government debt (green line) have been small relative to tangible asset and stock market losses, however from an income perspective (money that actually contributes to GDP), it is very clear that government deficits have prevented (so far) a far worse outcome. (I'll include flow/income charts in a separate post).